Indian eCommerce sector is on a high right now. ASSOCHAM has recently released a report which states that ecommerce in India has grown 88% in the year 2013, compared to 2012. Total of $16 billion or Rs 96,000 crore worth of goods were sold via online medium in India, last year. This is a staggering increase as in the year 2009 the ecommerce market stood at $2.5 billion, which increased to $8.5 billion in 2012 and then increased 88% in 2013 to touch $16 billion. Goods such as electronics gadgets, apparel and jewellery, home and kitchen appliances, lifestyle accessories like watches, books, beauty products and perfumes and baby products are selling like hot cakes right now, and it is expected that more such products would witness an increase in online consumer demand. It has been predicted that by 2023, Indian eCommerce market would be worth $56 billion. What are the top 5 trends which should make a positive impact on Indian eCommerce industry for the year 2014? Mobile is expected to start a revolution in terms of its usage and order fulfillment for ecommerce transaction. It is already evident that more and more Indians are using mobile to access Internet, and the day is not far when most of the online transactions happen only on mobile. Indian ecommerce players can focus on better mobile checkout process, which is in stone-age as of now. Concepts such as mobile wallets can be introduced, which can further ease the process of online order and payment. As of now, Indian eCommerce market is mainly geared for B2C business model; wherein online retailers are trying to woo online consumers and sell them retail products. 2014 is expected to witness increase of B2B business in online medium. B2B is where the real money lies, and if Indian eCommerce sector can win the confidence of corporate and enterprise segment, then it would be a major boost to the overall eco-system. Most of the Indians who do not opt for online shopping are scared of the product delivery and the time it takes to get that product. And their fear is not entirely fiction. There have been instances when consumers ordered mobile phones online and they received stones in return. Product deliveries to Tier 2 towns still take several days more compared to Tier 1 cities, and this trend should be reversed. Ecommerce players should make sure that they ship the right products, and in the right time frame. No doubt a major over-hauling of the whole system is required but it is necessary. Flipkart has launched their own delivery network to overcome this problem, and kudos to them for this decision. I admit that not all ecommerce players can choose to launch their own delivery network, but the services can be consolidated and worked-upon to give their consumers better and faster service. This trend has already started with Amazon launching 1-2 day guaranteed delivery model, which was soon followed by Flipkart as well! After sales service is another issue which is detracting potential online buyers from choosing ecommerce. Often, they wonder what if the product they have ordered doesn’t work? In case of physical shops, they can go there in-person and demand a replacement. But what in case of eCommerce? Education and Awareness is required in terms of after-sales service from ecommerce businesses. They need to clearly and honestly inform the customer what are their options in case the product is not what they had ordered. This whole process needs more refining and brain storming so that more and more Indians can comfortably shop online, without any fear. It seems that the Indian eCommerce industry is still stuck in medieval practices of offering discounted and/or freebies to attract buyers. Although it works, this practice has serious flaws. It is bleeding the industry, and is not considered a healthy business practice. It means that a new, cash-rich ecommerce player can create a monopoly by offering even more discounted items and literally killing other players. In a way, this trend is like a race to the bottom, eventually everyone will be a loser at the end. Ecommerce businesses should create some interesting pricing models, based on which they can enhance their operations without spoiling the consumers. They should create value-addition to the overall pricing structure, and use the term “free” and “discounted” only in special occasions and events. And lastly, I predict that the marketing strategy for ecommerce will experience drastic changes in this year. Large ecommerce players are more focused on interruption based marketing like buying TV ads and newspaper advertisement to promote their services. People will no doubt take notice and once in a while visit the website as well. But the conversion from a casual visit to a buying consumer will hardly take place. In order to lure more first-time buyers into the ecommerce eco-system, business owners should embrace content based marketing and embed this practice into their everyday operations. Using more and more content for their online marketing efforts can give them a larger platform to entice online buyers and to increase their sales. It will help them to create their own tribes of followers, their own cult. 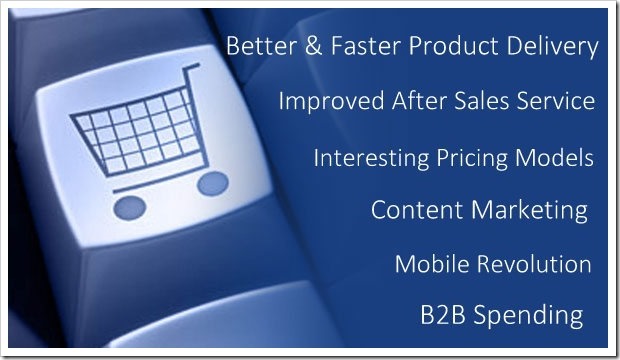 I am looking forward to more Content Marketing approach for eCommerce portals in 2014. What are your predictions for ecommerce industry in 2014? Please share your views by commenting right here! [Updated] Is KlickPay Snapdeal’s New Payment Gateway?